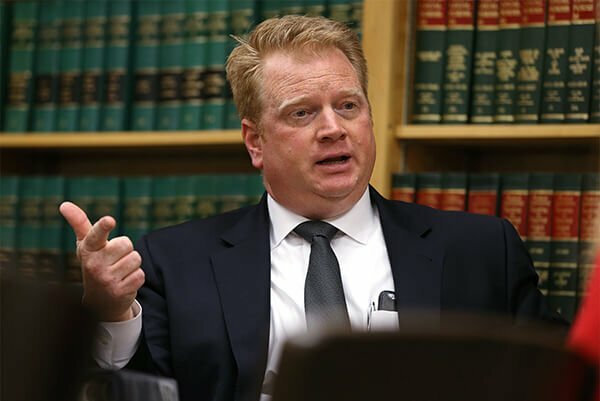 As the Nevada Legislature resumes session this week, Carson City District Attorney Jason Woodbury and other officials are looking for clarification how to implement the legalization of recreational marijuana, which was approved by Nevada voters in November’s election. For now, Carson City is in a holding pattern. The measure, which legalized the recreational use of marijuana starting Jan. 1, allowed the Department of Taxation one year to craft regulations of the approved establishments. The Department of Taxation expects to have the regulations drawn up by summer. While users can grow their own plants — six per person or up to 12 per household — they are prohibited from doing so within 25 miles of an approved establishment. Only those establishments will be allowed to sell it. Woodbury said a city task force is meeting to iron out the process of implementing the new law. “To some extent, the writing was on the wall, and we knew the passage was a very real possibility,” he said. “We were preparing for its passage for a long time. You think you can evaluate every scenario that might come up. We have a handle, certainly, on the basics, but there’s a lot of filling in the gaps. “As the law goes into effect, and we see real-life scenarios we didn’t think of, there’s a lot of work to do,” he said. Law enforcement has already had to address the use of drug dogs in detecting controlled substances inside a vehicle. The dogs are trained to alert officers of an array of drugs, including marijuana, which is no longer illegal. There also needs to be some refining when determining if a person is driving under the influence of the drug. “We’re in a strange new area,” Woodbury said. They do have some insight, however.